A small mosaic tile was discovered by Phil Dayvault in May 2002 in the depots of a museum in a faraway land (Şanliurfa, Turkey). Phil had immediately recognized its unique identity. Later, forensic comparisons concluded that the mosaic tile Image had served as "the prototypic model of numerous, ancient classical depictions of Jesus Christ." Most importantly, it derived from the Face of the Man of the Shroud of Turin, the traditional burial cloth of Jesus Christ. In his article, "FACE of the GOD-Man", Phil Dayvault describes the 2002 discovery of a small mosaic tile which contains significant implications. The Image on the mosaic is derived from the Face Image on the Shroud of Turin, and subsequently has been concluded by Phil to be the prototypic model of numerous ancient, (c. AD1st-6th Centuries) classical sacred artistic depictions of Jesus Christ throughout the Old World. This small mosaic, called the ISA Tile, was also determined by Phil to be the historical KERAMION which hung over the Western Gate of the Citadel in ancient Edessa, (now-Şanliurfa, Turkey). It was hung there reportedly to commemorate the entrance through which St. Thaddaeus, the likely transporter of the unique cloth, the "Image of Edessa" (considered by many to be the Shroud), entered to see King Abgar V during AD1st Century, circa AD30. Further confirmation supporting Phil's earlier claims came to his attention during the summer of 2015 and is provided herein. While conducting research in Şanliurfa during the past recent years, Shroud scholar, historian and linguist, Mark Guscin of Spain met with Dr. Mehmet Onal, the Turkish archaeologist in charge of excavations and preservation of mosaics. Guscin wrote in his PhD thesis, "The Tradition of the Image of Edessa", that he was personally told by Dr. Onal that "a mosaic of the Image of Edessa ...was kept in storage at the museum." Further, Guscin wrote, "Dr. Onal and the museum curator (in person) confidently state that the mosaic is a copy of the Image of Edessa."(Emphasis-mine). They were referring specifically to the ISA Tile mosaic. This strong declaration confirms some of Phil's earlier and original claims made in 2002. The forensic, circumstantial, documentary and historical associations of this small mosaic tile with numerous ancient depictions of Jesus Christ, and derived from the Shroud, strongly corroborate the authenticity of the Shroud as the actual AD1st Century burial cloth of Jesus Christ. Look at the evidence and see for yourself! The KERAMION, Lost and Found: A Journey to the Face of God provides new evidence and actually REVEALS what other Shroud books may only "talk" about. It also contains yet another new discovery regarding Early Christianity and the Shroud Face. ORDER your copy today...and EXPERIENCE the JOURNEY! The following clarification is provided for a more precise understanding of the above-described "ISA Mosaic Tile." Yehovah (Old Testament Hebrew Name of God) of the Christian and Jewish faiths IS the God of Abraham, Isaac and Jacob. However, the moon-god worshiped by the Islamic faith IS NOT the same as Yehovah God, the Creator of the Universe. Further, it is strongly emphasized that the name of the Muslim prophet, Isa, or jesus, DOES NOT represent the same-named Second Person of the Christian faith, Jesus Christ. The Muslim prophet, Isa, or jesus, IS NOT the same as Jesus Christ, or Yeshua (Hebrew Name of Jesus), the Messiah, the Triune Savior and Son of Father Yehovah. The Muslim moon-god, All-h, had no son. However, for clarification purposes of the title of the mosaic tile, the name,“ISA, ISA", was loudly exclaimed by the Muslim curator at the very moment I discovered the mosaic in the museum depots of the Şanliurfa (Turkey) Archaeological Museum in May 2002. As soon as my flashlight beam shone across its surface, I immediately recognized the Facial Image of the mosaic as having derived from the Shroud of Turin, the traditional burial cloth of Jesus Christ, and which I have studied since 1973. 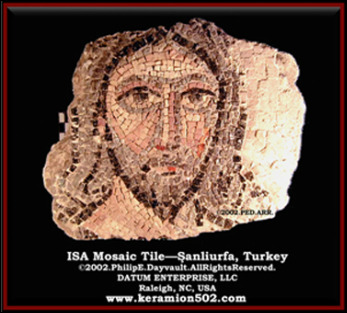 Subsequent research concluded forensically that the "ISA Tile", as I called it, had served as "the prototypic model for numerous, ancient classical depictions of Jesus Christ", as present throughout the Old World. The identifications were based on the presence of unique, individual characteristics present on both images, as well as other supporting factors. Most of the compared depictions included a “Christogram”, or inscription, e.g., “IC~XC”, specifically identifying the subject as Jesus Christ! Therefore, the accurately expressed title during the momentous discovery, “ISA Tile”, explicitly and exclusively refers to what I saw and what is actually depicted on the mosaic; and that is, the FACIAL Image of the Risen JESUS CHRIST, Yeshua HaMessiach, Son of Father Yehovah GOD, of the Christian faith! HALLELUYAH! God so loved the world that He gave His only Son, Jesus, to die for our sins. Through His Grace and by our faith and belief in Him, we shall have eternal life with Him. His Love is everlasting. JESUS CHRIST, OUR ONLY HOPE, openly invites people of ALL faiths, or none, to come to Him in sincere repentance and ask Him into their lives. "Thomas said to him, 'Lord, we don’t know where you are going, so how can we know the way?” "Jesus answered, 'I am the way and the truth and the life. No one comes to the Father except through me. '"(John 14:5-6-NIV). Make a personal decision for Him today, before it is too late! Your eternal destiny literally depends on it! The entire contents of this website are Copyright©2019.PhilipE.Dayvault.AllRightsReserved., unless otherwise noted. Access to this site does not grant any rights to copy, publish, sell, license, distribute or use any included materials, including photographs, video clips, or text in any form or media, without the expressed and written permission of the individual copyright holder. Editorial opinions expressed are solely those of the respective authors.